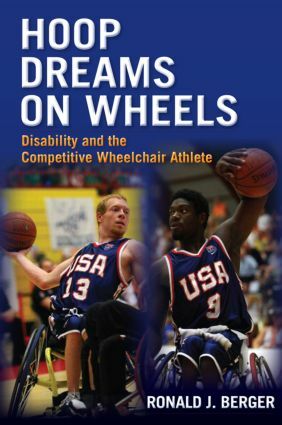 Hoop Dreams on Wheels is a life-history study of wheelchair athletes associated with a premier collegiate wheelchair basketball program. The book, which grapples with the intersection of biography and history in society, situates the study in broader context with background on the history and sociology of disability and disability sports. It documents the development and evolution of the basketball program and tells the individual life stories of the athletes, highlighting the formative interpersonal and institutional experiences that influenced their agentive actions and that helped them achieve success in wheelchair sports. It also examines divisions within the disability community that reveal both empowering and disempowering aspects of competitive wheelchair athletics, and it explores some of the complexities and dilemmas of disability identity in contemporary society. The book is intended to be read by a general audience as well as by students in college courses on disability, sports, social problems, deviance, medical sociology and anthropology, and introductory sociology. It also will be of interest to scholars in the sociology of disability, sociology of sports, and medical humanities, as well as life-history researchers and professionals in the fields of physical education, therapeutic recreation, and rehabilitative counseling. Ronald J. Berger (Ph.D., UCLA), is Professor and Chair of the Department of Sociology at the University of Wisconsin, Whitewater. M. Juette & R. Berger. Forthcoming (2008). Wheelchair Warrior: A Life Story of Gangs, Disability, and Basketball. Temple University Press. R. Berger, M. Free, & P. Searles. 2005. Crime, Justice, and Society: An Introduction to Criminology. 2nd ed. Lynne Rienner Publishers. His most recent scholarly articles on sport and disability have been published in The Journal of Contemporary Ethnography and Sociological Quarterly. He has taught undergraduate courses in the sociology of disability, introductory sociology, and social problems.